A young man has fallen victim to ritual killing after he was brutally murdered before his eyes was plucked out. Residents of Techiman in the Brong Ahafo Region of Ghana have been thrown into a state of shock following the murder of a man believed to be in his late 30s in what is suspected to be a ritual killing, Adom News reports. The ritualists plucked out the man’s right eye as he was found lying in a pool of blood by a shop along a popular street known as Hausa line. 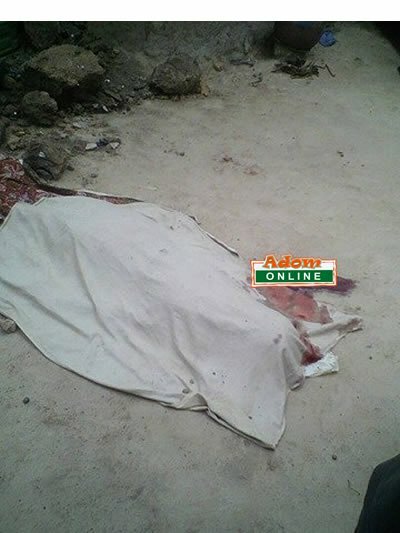 The first incidence according to Winners FM’s Addo Ali, a local journalist in the area occurred at Techiman Zongo close to the former premises of Armed Maternity Clinic where a young man in his early 30s was murdered and his right eyeball removed. The second person in his late 30s who also had his left eyeball removed according to the Ali Addo was still sustaining breath at the time the police arrived at the traffic light close to the Techiman Central Market, the scene of crime. He disclosed that the incident might have happened at about 2: am on Monday, May 29, 2017. The police in the area have ruled out theft but said they are conducting further investigations into the two incidents. Chief Superintendent of Police Emmanuel Twumasi Ankrah, the Techiman Divisional Police Commander who confirmed the incident said his outfit has launched investigations into the matter. Meanwhile, the body of the deceased has since been deposited at the Holy Family Hospital morgue pending an autopsy.